The SkyTrain is one of Vancouver’s best transportation bargains. For $9.00, the price of a DayPass, you can ride Vancouver SkyTrain the length of its 28km route and return. With the same $9.00 ticket, you can take side trips on the SeaBus to the North Shore or ride as many of Vancouver’s 1000 buses as you can squeeze into the day. The Canada Line is the line that conveniently goes directly to and from Vancouver Airport or YVR. From the airport to Waterfront Station at the end of the line, the trip takes just 26 minutes. If you need specific Vancouver Sky Train schedule information, consult the Translink website or call Translink at 604-953-3333. For individuals, couples, families and groups, private transportation is often the most economical and definitely the most convenient way to get around in Vancouver. For information about Private Tours, call 604-990-9299 or 1-800-913-9207. To travel from one part of Vancouver to another, the Vancouver SkyTrain, like the bus and SeaBus, costs $2.50 for one zone, $3.75 for two and $5.00 for three. You will find zone maps at each skytrain station. SkyTrains run from about 5:30AM until around 1:00AM, depending on the station.Seniors and children pay reduced rates. DayPasses are available at the SeaBus station, Vancouver SkyTrain station, Safeway grocery stores, Mac convenience stores, 7/11 convenience stores, Save On Foods and at many London Drugs and Shoppers’ Drug Marts. The SkyTrain is not just a bargain, however. The Vancouver SkyTrain is one of the best ways to see Vancouver and the surrounding area. From the Vancouver SkyTrain, you get great views of downtown, neighborhoods and the splendor of the North Shore mountains. You can catch the Vancouver Sky Train at any Sky Train stop, or at its terminus Waterfront Station, just east of Canada Place in downtown Vancouver. If you only want to go to the heart of downtown, take the Vancouver SkyTrain two stops and exit at the Granville Station. That will put you in the heart of downtown Vancouver. You can shop at Pacific Centre Mall or walk a couple of blocks south on Granville to Vancouver’s most fashionable shopping area, Robson Street. If you want to see some of the attractions outside Vancouver proper, the SkyTrain is an easy way to do it. For example, you can take the Vancouver Sky Train to Metrotown, B.C’s largest shopping complex with over 500 shops and services, 22 cinemas and the Metropolis Entertainment Centre. Metrotown is only eight stops from the Waterfront Station. 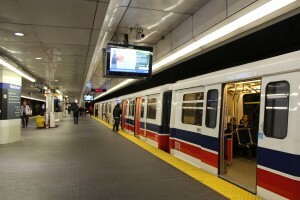 Six stops beyond Metrotown is the centre of New Westminster, Columbia Station. It puts you near the Canada Games Pool where you can swim in the Olympic size swimming pool or work out in the fitness centre and training circuit. The facility is open daily from 6:30am-10:30pm. From the SkyTrain, transfer to Bus #102. From The Columbia Station you are just four stops from completing the entire 39 minute grand tour to the end of the line Surrey’s King George Station.